The 31st Annual Graduation Exhibition of Carleton University’s School of Industrial Design in Ottawa from April 18 to 21. Named “Towards Better Design”, the exhibition featured the work from all years of the program, while celebrating the successful completion of the major studio projects by the graduating class. This year the graduating students tackled an eight-month sustainability exercise with the title ‘Towards Ecoville’. Under the guidance of the associate professor Brian Burns, the graduating class was asked to envision Ecoville – “A place where people live and work under the ‘eco’ banner of holistic sustainability”. This was not an easy task. Young designers had to consider numerous aspects of a product in order for it to have the right to belong in Ecoville. The students dealt with several aspects of everyday life after dividing into groups and pursuing projects in the areas of food use, water, healthcare, household, clothing, outdoor activities and transportation. Among the projects are: an environmentally sensitive play structure for children, an LED public lighting system requiring less power while using the light more effectively, a bulk food dispenser that reduces wasteful consumption of packaged foods, a self-watering indoor herb garden, a domestic grey water treatment system to help water any garden, a versatile bicycle storage system and a portable shopping cart using standard bins and suitable for use attached to a bicycle, on a bus or on foot; to name a few. The products created were striking in their simplicity and reflected the amount of thought and work that went into their development. All the projects were designed with careful consideration for energy use and materials, while enabling the user to lead a more sustainable lifestyle. Description: A neighbourhood compressed air vehicle for personal transportation embodying the sustainable benefits of a bicycle and the psychological comforts of a car. • Driven by zero-emission compressed air. • This design relies on development of low-seed roadways in the current city infrastructure. Being a new vehicle class, this concept car is designed to have a maximum speed of 80km/h and has a driving range of about 50km. 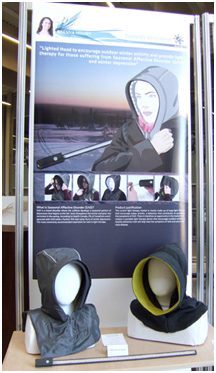 Description: A lighted hood to encourage outdoor winter activity and provide light therapy for those suffering from Seasonal Affective disorder (SAD) and winter depression. Features: Uses a flexible band of led lights and is adaptable to hoods on many types of clothing. Description: A domestic kitchen sink system to facilitate washing dishes by hand that can be easier and more efficient while using less water and energy. • Dish and cup racks for dirty dishes that can be stored as in the sink so on the countertop. Description: A cooking element for use on countertops and dinner tables encouraging the family dining experience. • A versatile cutting board that improves accessibility and can serve as a center piece during the meal. Description: A transit shelter system that can be configured to reflect the local environment and encourages the use of public transportation by improving the overall experience throughout the year. Among the work on display at the exhibition were projects done by the students from the first through third years, which highlighted exercises in sketching, rendering, CAD, form giving and model making, which form a vital part of the design development process. A less obvious but very important aspect of the exhibition was that the event itself involved the sustainable practices that would be employed in such an exhibition in Ecoville: the structures were re-used Octonorm, the display surfaces were either the tables used every day in the Industrial Design School, or were built from untreated plywood, which would later be re-used in the school’s wood shop for next years project work. There were no foam-core boards, just paper posters, backed by the off-cuts of printing paper rolls used at the university’s printing services department. The exhibition was held in a naturally lit open area, which reduced the energy used for lighting. These are just a few examples of the thoughtful approach taken by the school. The third year students, graduating in 2010, demonstrated outstanding skills in designing the event and making it look beautiful. The variety of ideas and the great quality of work on display at the 31st Annual Graduation Exhibition leaves no doubt that the future Annual Graduation Exhibitions will continue to impress and inspire.